Be careful this game is an extension of Dice Masters: Iron Man and War Machine ... + 5 more+ 5 more and cannot be played alone. 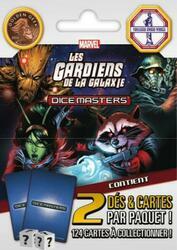 To be able to play it you must have a copy of the game Dice Masters: Iron Man and War Machine ... + 5 more+ 5 more. Contents of the box : 2 dice, 2 cards.